In 1773, Isaac Haines and others petitioned the General Assembly to permit the building of a dam to power a gristmill and sawmill. It is said that the workmen building the mill could hear the roar of the cannons during the battles at Redbank, now a National Park, near Gloucester. The gristmill was completed and in operation by the spring of 1778.The brick house, referred to as the "Miller's House," located across the millrace, was built by Nehemiah Haines about 1785. His son Charles inherited the mill and enlarged it from its original single story structure to a three story structure in about 1830. The blacksmith shop and a small barn were built at about this same time. William S. Kirby bought the mill complex in 1877 and again changes were made. In the next few years the roof was lifted adding a fourth floor. Another major change was the removal of the water wheel to be replaced by several more efficient water turbines. It was in this era that the complex was at the height of productivity. The sawmill was, kept busy sawing logs for shipment not only' to local lumber yards but also to Philadelphia and Baltimore buyers. The gristmill was producing wheat flour, buckwheat and rye flour, along with cornmeal and chicken feed. The flour which was produced here was of very good quality and was much in demand by bakeries along the east coast. By World War I more modern machinery had replaced the millstones and the mill stopped producing flour in the 1920's and concentrated more on livestock feed. The sawmill finally shut down because of the lack of local timber. The blacksmith and wheelwright shop closed down with the coming' of the automobile. The gristmill stayed in operation under water power until 1961 when, because of low water and mechanical problems, it was converted. to electricity. It was still in partial operation in 1969 when the Medford Historical Society purchased it from the Kirby Brothers. This mill was the last operating commercial mill in New Jersey. The mill was declared a State Historical Site in July of 1971, and was placed on the National Register of Historic Sites in September of 1972. It is the hope of the Medford Historical Society to restore the complex to working order so that our generation and future generations can wander back into the past and see part of early Americana. 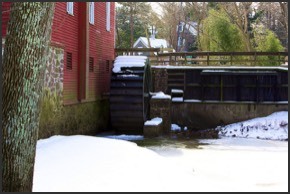 To date, restoration efforts have included the replacement of a working Waterwheel, along with the necessary foundation, shafts and gearing etc. to once again operate a pair of millstones. The Mill Complex has an extensive collection of antiques and an interesting museum that includes a Country Store, a Milliner's Shop, Print Shop and a Carpenter Shop. There is also a working Blacksmith Shop and Sawmill. The Mill complex also includes a storage barn, sawyer's house and a carriage barn. We plan to convert the storage barn into farming museum, the Sawyer’s house will become a historic library and research center and the carriage barn will store our historic wagon collection. In addition to the mentioned buildings the Society restored and maintains the Cross Keys School House. This is the last standing one room school house in Medford. 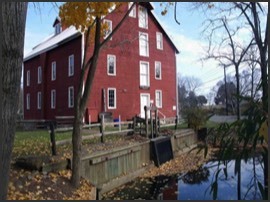 The Medford Historical Society hosts a variety of events at Kirby's Mill. Come out and enjoy the activities this year! Click on "Events" above for details.